Watching cherry blossoms is a way to celebrate the arrival of the spring. It`s an ancient Japanese tradition. 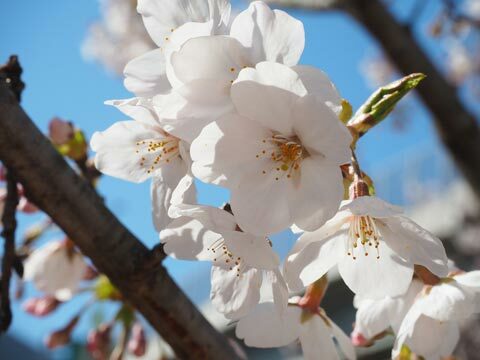 The full bloom period changes depending on the region and climate, but approximately a period is between the end of March and the beginning of April. The full bloom goes on just for a week. Cherry flowers bloom a very short period and after that petals gently fall on the ground. People in Japan feel and love that transient. 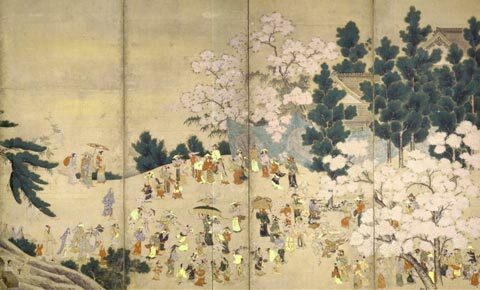 From Nara until the Heian period, court aristocracy members hold poems composition gatherings in occasion of the cherry bloom, this is the origin of the Hanami. 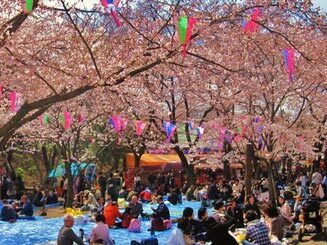 In the Kamakura period cherry blossoms viewing spread among all the social classes and become fashionable for samurai and merchants. In the Edo period it was established as an amusement for the whole population. Regarding Hanami`s origin there is also the theory suggesting that it generates from the ancient farmers beliefs in the “Sa” god. The theory says that ancient farmers offered cherry trees to the god, prayed for an abundant harvest and hold banquet during the bloom period. Sakura is Somei Yoshino! 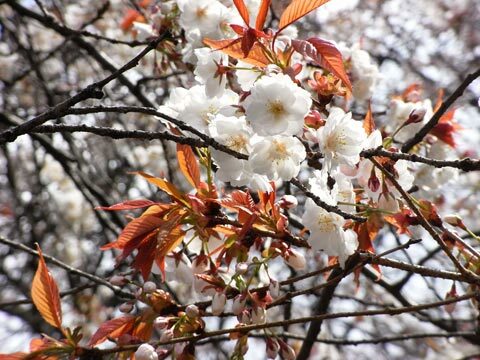 The 80% of cherry trees in Japan are this particular variety. The leaves sprout only after the bloom.Somei Yoshino is the standard variety of tree used for blossoms viewing and its blooming period starts from the south and continue toward the north of Japan. 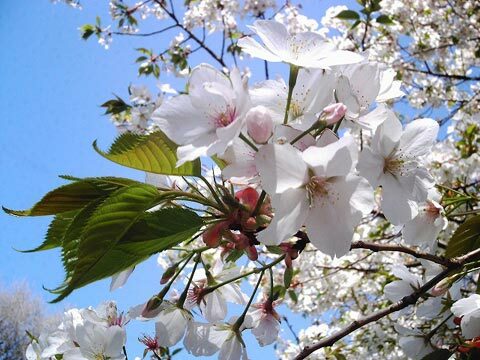 In this variety of cherry tree the green leaves sprout along with the blooming flowers. These trees give reddish-brown leaves that sprout along with the blooming flowers. Is the generic name for a type of cherry trees which branches droop like a willow. Do not leave your shoes or your personal belongings on others people sheets. 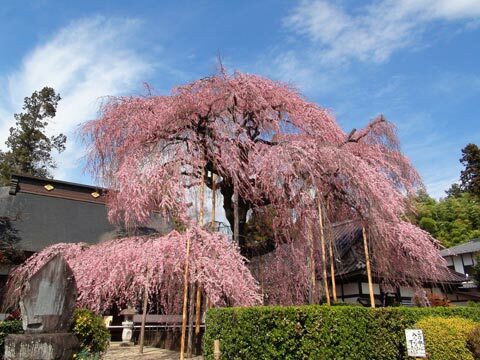 There are about 100 trees that bloom in the temple and in the fool bloom period the sky is filled by the color of cherry. We also suggest appreciating the night view of cherry blossoms. Is very popular the cherry`s view in front of the Shidarezakura, the centenary main temple. 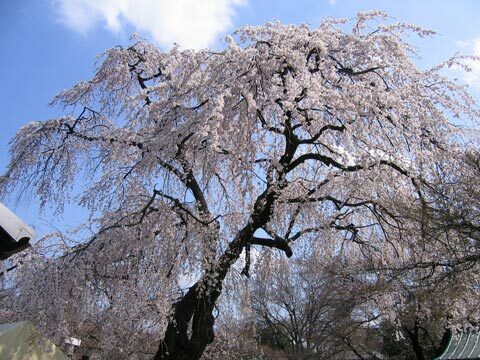 During the full bloom period in the night cherry trees are lighted up and create a suggestive atmosphere. 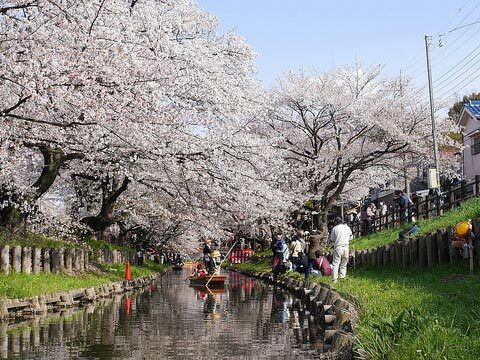 A 500 meter long row of cherry trees is planted along the Shingashi river. The flowers reflect their shape and their color in the water and also during the cherry blossom falling period is possible to appreciate a very beautiful landscape. The principal entrance of the Kawagoe Girls Public High School. There is a row of cherry trees in front of the main gate of the high school. It`s really easy access to this spot because is close to Kawagoe-shi Station. The Hanami map of Kawagoe city.